Click on the questions below to reveal the answers! The creation of a bronze sculpture is a rather long but rewarding process. First, the artist takes his or her idea for the sculpture and makes a model or maquette out of clay or wax. The model may take days, weeks or months of work to finish. The model is then taken to the art foundry. Using the artist model, skilled workers make a rubber mold of the model. This rubber mold is backed with fiber glass or plaster to make it rigid. The mold is often composed of many pieces depending on the complexity of the model. This mold will also take days or weeks to complete. Wax is sloshed into the mold and poured out several times. This will create a hollow wax model that is an exact match for the original clay model. A wax cup, runners and sprews are attached to the wax sculpture to form channels for the molten bronze to flow through. A multi-layered ceramic coating, or shell, is applied to the wax. The wax model, covered in a ceramic shell, is fired to 2000 degrees F. This sets the ceramic material and melts out the wax. Now the hollow ceramic shell is filled with molten bronze and left to cool. The shell is removed and the cup, runners and sprews are cut off. The bronze sculpture is ground, polished and sand blasted. A patina, or chemical color, is applied and the surface of the sculpture is waxed and polished. After weeks or months of careful painstaking work the sculpture is mounted on a base and ready to present to the customer. Interested in how bronze sculptures were made in ancient times? Check out the video below! Bronze has been used for thousands of years to make everything from swords to jewelry. Traditionally it has been an alloy of copper and tin. Copper will usually make up 90% of the alloy with tin as the remainder. Modern art foundries usually use a mixture of 95% copper and 5% silicon. By adding Tin to Copper, early humans create the worlds first alloy – Bronze. Watch the video below to learn more! A patina is a color or colorful incrustation found on old bronzes. This color is formed by a chemical reaction between the copper in the bronze and elements found in the soil and air. This patina can be almost any color, from shades of green, blue, red, black and brown. Today to duplicate the colors or patinas of old bronzes, chemicals are applied to the new bronze statues. Want to learn more about patina? View the video below! How do I care for my bronze sculpture? Bronze sculptures have been found that are thousands of years old. Your statue will last into the next millennia with almost no care. The sculpture should be lightly waxed once or twice a year. Using a soft cotton cloth apply a thin coat of Johnson’s Paste Wax or Kiwi Shoe Polish, Neutral. Let this dry for 20 minutes and gently buff with a clean, soft, cotton cloth. 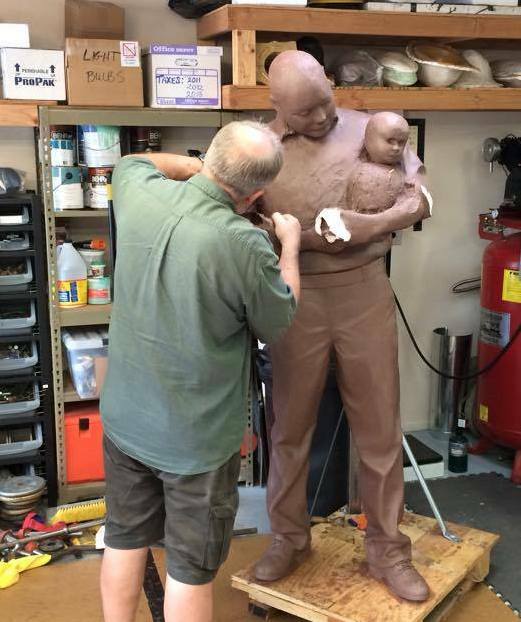 Watch the video below to learn more about caring for your bronze sculpture. Why do bronze sculptures cost so much? Unlike plaster or cold cast bronzes, (plastic with the addition of bronze powder sometimes called bonded bronze) true bronze statues have survived for thousands of years. Bronze statues can be handed down from generation to generation. The process of creating and casting a bronze sculpture takes many weeks or months to complete. It takes the combined talent and skill of the artist and foundry worker to produce the final work of art. I hope you will agree that the final product is well worth the time and effort. 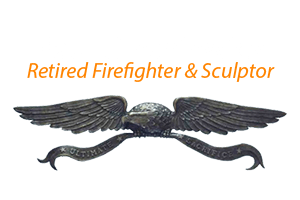 The Art Bronze Foundry explains in the video below how to identify a quality bronze sculpture – which you’re guaranteed to get with 911 Sculptures! How do I attach my Outdoor Statue to a Pedestal or Base? Carefully place the statue on its pedestal or base and position it in its final location, taking care not to scratch the pedestal. When moving the sculpture remove all watches, rings and jewelry that might scratch the statues finish or patina. Belt buckles and pant rivets may also scratch the statues surface. If using mechanical lifts or cranes to move the statue make sure to use soft straps and padding to insure that the statue does not get scratched. Use pieces of masking tape at all four corners to mark the location of the statue’s bronze base. Remove the statue. Using the tape as index marks, align the mounting template and secure it to the pedestal with masking tape. Mark the centers of the threaded rods indicated on the template. Remove the template and drill the holes in the pedestal with the appropriate size masonry drill bit, normally one size larger diameter than the diameter of the mounting rod. Drill the holes to a depth at least 3/4 inch deeper than the length of the threaded rods. Clean all holes of all dust and debris with compressed air. Lay the statue on its back on a movers blanket or piece of carpet being careful not to scratch the patina. For large statues lift the statue using a fork lift or crane. Screw the threaded rods into the nuts on the bottom of the sculpture. Place the statue with the threaded rods attached into the holes in the pedestal. Check that the statue sits all the way down on the pedestal and aligns with the tape index marks and is positioned properly. Remove the statue and fill the holes in the pedestal with epoxy about 2/3 of the way to the top. Set the statue back into the holes and quickly make any minor adjustments needed. Remove the masking tape.The epoxy will set in about 15 to 20 minutes as indicated on the epoxy instructions. The statue is now permanently attached to the pedestal. Please read and follow all directions found on the mounting epoxy tube. How do I maintain my Outdoor Bronze Sculpture? Paint brush with the metal ferrule taped to avoid scratching the patina. Clean, soft cotton cloths or rags. Non metallic bucket, (plastic or rubber) filled with warm, clean water. Non-ionic or neutral PH soap, such as Orvus. Orvus can be found in pet and feed stores as it is used to bath horses. You may also use Johnson’s Baby Shampoo. Plastic or wood handled soft bristle, scrub brush and/or sponge. To maintain the appearance and longevity of your sculpture it should be cleaned and waxed once or preferably twice a year. It is best to pick a warm, clear day. First, rinse off the sculpture with water. Then mix 3 gallons of warm water, in a plastic bucket with Orvus cleaner at the ratio of 1 once of Orvus to 3 gallon of water. Start at the top using a soft bristled, plastic or wood handled scrub brush and/or sponge to clean all the surfaces. Rinse the statue well. Using a clean, dry towel, blot off all the remaining water and let the sculpture dry in the sun. It is very important that the statue is completely dry and warm before applying wax to the bronze.When the bronze is dry and warm to the touch, it is ready to have the paste wax applied. Using a paint brush, with its’ metal ferrule taped, apply a light coat of wax to the entire statue. Let the wax dry for 15 to 20 minutes and then buff using a clean, dry, lint free, cotton cloth. A second coat of wax can applied.Never use any chemicals, cleaning solutions, tarnish removers, Brasso, furniture polishes/oils or abrasive cleaning pads on your bronze sculpture. Avoid exposing the sculpture to sprinklers, fertilizer spray, pesticides, ammonia and chlorine.With proper maintenance the patina will slowly mellow and deepen. This is considered very desirable and part of the appeal of owing a bronze work of art. Work With Our Sculptor to Order! Each of our sculptures are made to order. We work with our customers to understand specific customization, installation needs, and timelines that are important to you. 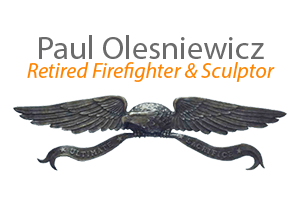 Each of our orders gets a FREE consultation with sculptor Paul Olesniewicz to make sure we meet all your requirements. Click below to schedule your consult and get a quote.